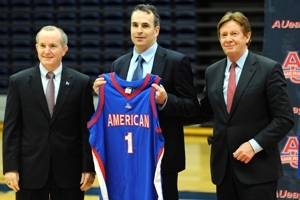 (Left to right) Athletics Director Billy Walker, Head Basketball Coach Mike Brennan, and American University President Neil Kerwin. Mike Brennan has been named the 17th head coach of the American University men’s basketball program in an announcement made Tuesday at a press conference at Bender Arena. "We welcome Mike Brennan back to the AU campus as our new men's basketball coach. He has achieved tremendous success as an assistant coach at prominent programs -- including Georgetown, Princeton, and AU -- and as a former student athlete at Princeton," said President Neil Kerwin. "His athletics experiences and academic values are a perfect match for AU and we look forward to a new era in AU men's basketball." Brennan comes back to AU after serving four years as an assistant coach at Georgetown University under John Thompson III. Most recently the Hoyas captured a share of the Big East Regular-Season championship and No. 2 seed in the 2013 NCAA Men’s Basketball Tournament. "I couldn't be more excited about naming Mike Brennan as the next Head Coach at American University! Mike embodies all the qualities we were looking for in a coach: integrity; character; experience recruiting at a high-end academic institution; ability to connect with players; toughness; and unmatched skills in player development and teaching," said Director of Athletics & Recreation Dr. Billy Walker. "Above all, Mike is the ideal role model and mentor for our young men to emulate. Mike understands the primacy of academics, but knows we can compete for championships as well--he's the perfect fit!" During his four seasons the team accrued 93 wins, posting at least 21 victories in each year while boasting all-conference players in Otto Porter, Jason Clark, Austin Freeman, and Chris Wright, as well as NBA star Greg Monroe. During his two seasons at American University, the Eagles experienced their two greatest years in program history, winning back-to-back Patriot League Regular Season and Tournament Championships, advancing to the school’s first-ever NCAA Tournament berth. AU posted back-to-back 20-win seasons in Brennan’s time, posting a program best 24-8 record in 2008-09, including a 13-1 mark in Patriot League play. "It's extremely exciting to be back at American University and to become head coach of the Eagles," said Brennan. "I'm so grateful to AU athletics director, Billy Walker, and the President of AU, Kerwin, for this wonderful opportunity. I’ve been extremely fortunate to have worked at universities that share such strong values and whose athletic programs reflect those values. I am confident that our program will continue to attract great student-athletes, one that our players, students, supporters and alums can be proud of." Brennan came to AU from his alma mater, Princeton University. He spent seven seasons with the Tigers, guiding the squad to three Ivy League titles as the top assistant. Brennan spent a total of 12 years with Ivy League institutions, serving one season as a volunteer assistant coach at Columbia University after culminating an impressive playing career at Princeton. He was a four-year starter as an undergradate at Princeton under legendary head coach Pete Carril. Brennan helped lead his team to Ivy League championships and the NCAA Tournament in 1991 and 1992. He was named Second Team All-Ivy in 1994. After earning his bachelor of arts in English from Princeton in 1994, Brennan went on to play professionally in the European Basketball League for teams in Germany, Belgium, and Portugal.